St Hugh's Boat Club is a great community to be part of. There the obvious benefits associated with competitive sports (for example increased fitness), but also due to the nature of rowing you will form strong bonds and life-long friends within your crews and the rest of the boat club. We aren't only about rowing, our social secretaries organise many events, including termly pasta parties and many crew dates with other colleges. There are several different levels of rowing ranging from 1st boats to 3rd boats, so if you want to get seriously involved or just give it a try, we can cater for all levels. 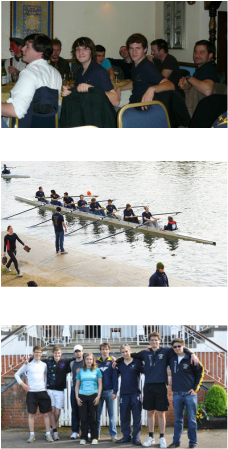 At the end of Michaelmas term the university holds Christ Church (ChCh) regatta, which is only for novice rowers. It's for everyone and anyone who's never rowed before so its the perfect opportunity to give rowing a try. It's kept very simple for your first ever race, 2 boats, side by side, set distance race, whoevers fastest wins. If you have rowed before coming to Oxford don't worry- our senior squads train throughout Michaelmas so you will get to row with the rest of the boat club and attend the legendary 'ChCh Curry' which is held to celebrate our novice rowers first campaign. Year on year it has proven to be notorious so is not one to miss! For Hilary Term & Trinity Term SHBC takes part in 'Bump's Races' (Torpids & Summer VIII's). A series of boats begin bow to stern with a length and a half between them, with the aim to 'bump' (or in other words make contact with) the boat ahead. These bumps races are only run in Oxford and Cambridge, they're amazing fun and something that's definitely worth experiencing while you're here! In usual SHBC style we also hold formal dinners after both Torpids and Summer VIII's, which always involve lots of food, drink and celebratory fun.